Loaded Au Gratin Potatoes - Home. Made. Interest. This Loaded Au Gratin Potatoes recipe is a cheesy, creamy au gratin potatoes recipe filled with sour cream, cheddar cheese, and bacon. Everything you love in a loaded baked potato turned into a delicious potatoes au gratin recipe. I don’t know if you have noticed by now but we love anything with cheese and bacon. Add those two ingredients to any recipe and you’ve got an instant comfort food. After I made my Duchess Potatoes last week I had a few potatoes leftover and I needed to make a side for dinner. 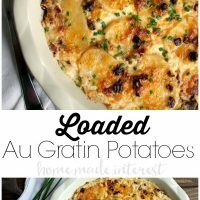 Instead of making boring old baked potatoes I stepped it up a little and made this easy Loaded Au Gratin Potatoes recipe. OMG, these things were soooo good! These potatoes are simple but delicious and they don’t require anything I didn’t already have in my refrigerator. You start by peeling potatoes and slicing them into 1/4 inch thick pieces. Then I whipped together some heavy cream, flour, sour cream, garlic, salt, and pepper. Then it’s all about the layers. You pour part of the liquid over them, and sprinkle each layer with bacon, and cheese. 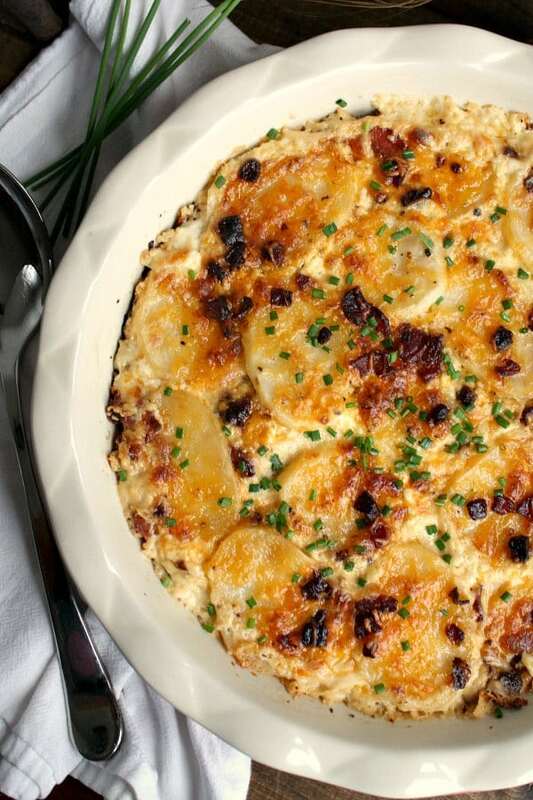 What is the difference between Au gratin and Scalloped potatoes? The big difference between the two dishes is the cheese. 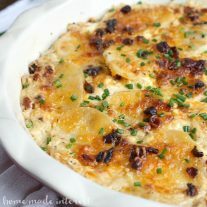 “Au gratin” by definition means covered with breadcrumbs or cheese and then baked until brown whereas scalloped potatoes are baked in a creamy sauce and topped with breadcrumbs. Both are delicious! When your layers are made you pop it in the oven and bake it while you finish up the rest of dinner. 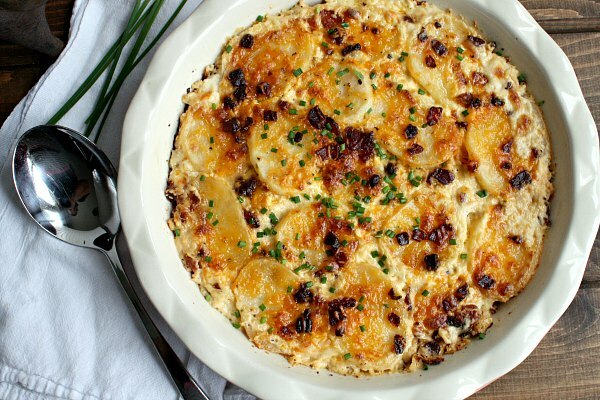 What you end up with is a creamy, cheesy, Loaded Au Gratin Potato dish with lots of bacon. Is there anything not to like about that? This only takes about 15 minutes to put together and it was ready to eat by the time I finished cooking the chicken we were having for dinner that night. Everyone loved it and the little bit that was left over heated up well the next day. I’d take this cheesy, bacon-y goodness over a boring baked potato any day! Grease an 9-inch or 2-qt. casserole dish with butter. Peel and slice the potatoes into ¼ inch slices. In a large bowl whisk together the heavy cream, and flour. Add Sour cream, garlic, salt, and pepper, mixing thoroughly. Arrange ⅓ of the potatoes slices in the bottom of the casserole dish, overlapping the edges. Pour 1/3 of the mixture over them, then sprinkle 1/3 of the bacon and ⅓ of the cheese on top. Repeat this step to make a second layer. For the final layer arrange potato slices and cover with last ⅓ of the liquid. Keep last ⅓ of cheese and bacon in reserve. Cover dish with foil and bake for 40 minutes. Then uncover dish and continue baking for 20 minutes. In the last 10 minutes add cheese and bacon to the top of the potatoes. Let dish cool for 10 minutes before serving. « Previous Post35 Holiday Entertaining Recipes + A $350 Gift Card Giveaway!! Please review the salt (and maybe pepper) measurement. I followed this exactly and when I measured out the salt, I thought “Hmmm this seems like an awful lot of salt.” but I just went with it and made sure I was using the correct measurement. Whoa! It was awful. Wayyyyyyy too much salt, it couldn’t be redeemed or ate 🙁 Otherwise it would have been very good. Everyone has different tastes, but I just can’t believe the salt quantity was correct. Typo? Thanks so much for the feedback! You are right, I copied it down wrong. That’s what happens when you test recipes all day. I used 2, 1/4 tsp of salt not 2 tsp. I’m so sorry you had to try that! I’ve updated the recipe. Me too…though I do love some good Mac and cheese :). Sour cream and bacon put these potatoes over the top! We had the same problem. The flavor is good, but the bake time is inaccurate. I followed the directions to a T, but my potatoes were still raw. Thanks for letting us know. We didn’t have that problem but we will take another look at the recipe. The ONLY thing I am going to change is to buy a block of cheese & shred myself. The pre-packaged shredded cheese is coated in wax to help prevent it from clumping. Yuck! It is au gratin season, isn’t it? I’ve already offered to make a batch for an upcoming dinner party. I like the photos showing how easy it is to make. Thank for the inspiration! We love au gratin season! I made this for Easter dinner and all 4 families that came together absolutely loved it. Definitely a keeper in my book. We love hearing that our recipes are loved by all! Thanks for letting us know. Making this for Christmas dinner. Can it be made a day in advance? Haven’t tried making it ahead but I think it should be okay then just reheat it day of. These potatoes were fabulous. Thanks so much for sharing your delicious recipe. I have mine baking now. I had to DBL the sauce recipe and I would have added about 3 more slices of bacon making it 4 per layer but I gave the kids the reserve. Lol thinking salt and pepper we’re not enough but didn’t want to over do just to be safe. Can’t wait to try it though. Just a couple of things. I had to use a 9 x 13 pan. Your recipe says only 9 and I didn’t want anyone to think 9 square or round pan would be big enough. You have prep time as 15 minutes. Took me almost an hour when you include the time to peel and slice the potatoes. But, it wasn’t wasted since I also cooked the bacon during that time. Also, if you use the extra large russet potatoes, you only need 2 of them. I made this for an Easter dinner and everyone loved it. It’s rich, delicious, beautiful and everyone wanted the recipe. I prepared it in the morning and cooked it for 60 minutes in my oven (saw the comments about some of it being raw. As long as it’s covered with foil, you can cook it a longer). I then took it to my brother’s for our Easter dinner (2 hours away). We put it in the oven at 400 degrees for 10 minutes, uncovered, with the last layer of cheese and bacon. Worked out very well. I am not a good cook, but this really worked. Great recipe. I realized after typing this I actually made a lot of changes due to the circumstances. Everything worked out and was delicious That’s the sign of a good recipe! Sounds like you are a great cook to me :). Thanks so much for taking the time to let us know the changes you made that helped it turn out so well. Hope you had a very happy Easter ! Hi. Can I make this and freeze? Would I bake it before freezing? Hi Paula, I have never tried freezing this and I’m not sure how well it would work. If you try it I would definitely bake it before freezing it.